A wedding is a beautiful time of any one’s life. Marrying your loved one in a perfect way is the desired of every individual. To plan things in such a way that nothing goes wrong on the wedding day is the desire of every couple. People start preparing for a wedding depends upon their traditions, culture, rituals, and customs. One common thing among all of these will be perfect without any hassle. 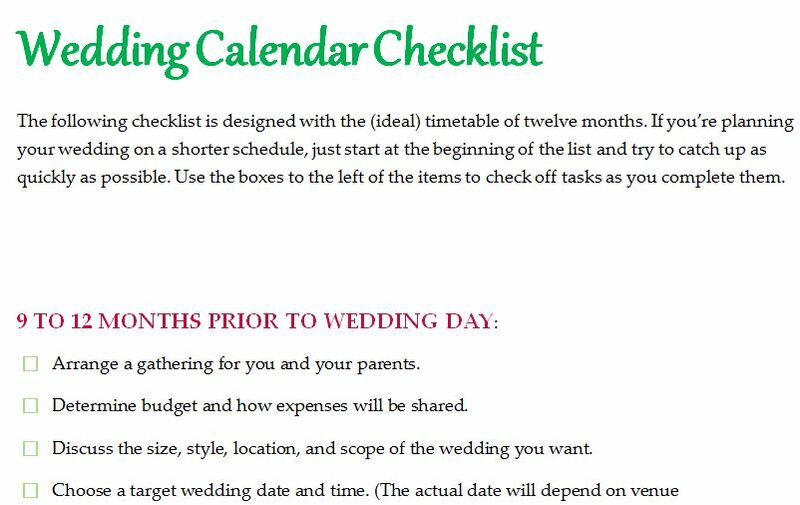 Wedding Calendar Checklist template is designed for all those people who care to manage things much before time. This calendar checklist is designed to prepare for marriage before one year of the wedding day. Using this calendar checklist will take you from beginning as much before as one year. All details are given in the form of checklist prior different times of the year. It starts with the planning of wedding done in 9-12 months prior wedding day and moves on to keep checking until a day before the event. we have added some snapshots of the template also that will guide you towards the usefulness of this calendar template.